If you play any form of Fantasy Footy in 2014 - you'll want to keep an eye on The Postman's Late Mail every week (published late Wed night or early Thu morning) and belowsee what Fantasy Trades he's doing the Friday before each Round. 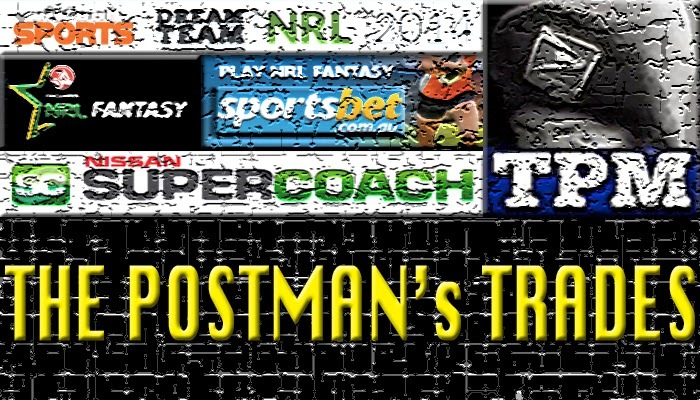 The Postman's team name for 2014 is 'This Postman Delivers' / 'The Postmen' and Round 1 delivered the following scores in the four main Fantasy Footy games. But the pre-season tinkering is over, now the trading begins. 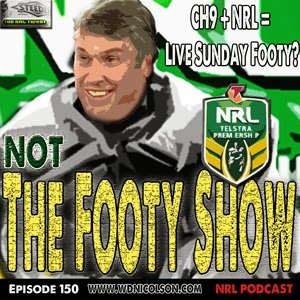 "I don't want to pick Tinirau Arona... never been a huge fan of his work-rate from his Rooster days but now that Andrew Fifita is out for two weeks, Siosaia Vave is out for one and Paul Gallen is on the shelf for at least six weeks... Arona is a MUST trade in in all formats... bar NRL Fantasy*. Yes it will cost you one trade now, and one trade later (when you cash him in) but it is hard to see him not getting minutes with both Fifita and Gallen out that will see his value jump considerably thanks to his strong Rd1 score. I started with Carlos Tuimavave in my centres in most formats but kept young Canberra DPP Jeremy Hawkins in my 2RF for just this occasion - if I missed a valuable FWD rookie/cheapie and wanted to trade a dud CTR for him. So that's what I've done. Trade #1 in SC, DT and SBF DPP Hawkins to the centres, Tuimavave OUT and Arona IN. Given NRL Fantasy's player database was as pathwork as their interface (that might be being kind to the interface actually) - young Panther Isaah Yeo was only available in the databases that The Postman himself created for Virtual Sports (who supply for DT, SC and SBF) and thus I've punted Tuimavave for Yeo on NRLF. Not having Arona isn't as big an issue in NRLF because simply put - he's already made his Rd1 owners money and theoretically at least - you've missed out on some of the easy cash that warranted the use of a Trade in the other formats. So no more trades for my teams though. Yes, if you missed some rookies by all means - ski-double up on your trades in Round 1 - but don't do it if you are pretty happy with your squad after Round 1. Trade Paul Gallen. My advice all pre-season was his best period will be pre-Origin... but that ankle didn't bend the right way and by the time he returns you may end up trading him in a few weeks when Origin rolls around and Gallen's Cronulla appearances dry up. This is just unlucky for PG13 and your team... roll with it and trade him out. Keep Andrew Fifita. Only a fool trades him after a 2 week suspension and a huge Rd1 score. YOUR call on SBW. Personally I didn't pick him in any format, but I would be holding if I did due to the Origin period when I anticipate picking him up. Have faith with your HLF Guns... yes I didn't have Johnathan Thurston either but I'm not trading DCE for him after one week. Try to have faith with Luke Brooks... try ever so hard. Really. PS. I am no longer providing content for Virtual Sports - and while I didn't get sacked (see my goodbye message on DT FB here), my pre-arranged agreement was from the pre-season to the start of Round 1 only, and the aim was to to drive interest in Dream Team and get as many people to sign up as possible. The downside of that campaign is it cost Virtual Sports some serious coin to make it happen... so as of right now, they will only be supporting their game technically until more resources to pay for the content become available. But don't rule out The Postman returning to the DT News site in the near future... which is why I'm writing this article on my site for the time being.